P90X Workout Review - Which Home Workout? Sculpts your body using resistance exercises. High-intensity workouts melt away fat. Not for someone on a low budget. There are cheaper alternatives available. Those without any upper-body strength may struggle at the beginning of the program. 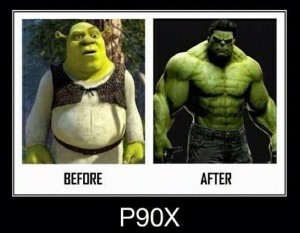 P90X is another great product from BeachBody. It comes with the typical BeachBody price tag and for the Ultimate kit you will pay upwards of $300. Despite the fact it comes with a lot of neat equipment I've had to remove one a half stars from the value rating due to it being one of the most expensive home workout programs I've ever used. The workouts are so varied and include a lot of strength-based exercises, both of which are important to me, which would have earned it five stars in the workout rating, however I've removed half a star due to length of some workouts. The equipment included is of excellent quality and it's great to use some equipment in a workout program rather than just bodyweight exercises all the time. Once again, BeachBody has provided use with a product that, with hard work, yields fantastic results. Five stars for effectiveness. What makes the P90X workout program different from other home workout programs? What are the main differences between a P90X workout and the workouts of its ‘competitors’, such as Insanity? This P90X workout review begins with an overview of the entire P90X home workout program, followed by a look at what’s included with the program and a comparison of each of the available packages. Next, there’s a review of the individual workouts and which exercises make up each of the workouts. After that, there is a brief discussion on the science and theory behind the P90X workout program followed by a look at the diet and nutritional tools that are included with the program. Finally, you will discover what results can be expected from the program and whether or not the P90X workout program is good value for money. Overview: What is the P90X Workout Program? As the name suggests, P90X – or Power 90 Extreme – is a 90-day extreme home workout program that combines cross-training and periodization. P90X is not for beginners: the target audience are those people who are ‘already physically fit’ and want a new challenge. The P90X workout program was designed by Tony Horton, along with other members of the BeachBody team, and is somewhat similar in nature to other home workout programs, such as Insanity, however the specific end-goals are slightly different. The goal of Insanity is to increase your overall stamina and burn fat by sky-rocketing your heart rate, and keeping it there, for the duration of the workout. By contrast, the P90X workouts were developed using resistance exercises designed to tone your muscles in order to shape your body. Basically, the P90X workout program will both reduce your body fat and tone your muscles. It was for this reason, combined with the fact I had a new love for high-intensity at home workout programs, that I decided to give P90X a try. If your goal is only to lose weight and you’re not concerned with shaping your body, then maybe Insanity is for you. Take a look at my Insanity review here. Each DVD contains one of the P90X workouts. This DVD explains how to use the program and what to expect from it. This is a relatively short guide but should be read. It explains the P90X workout program in a little more detail. It explains how the program is d and what to expect from each of the workouts. This is quite a detailed booklet which begins by determining which nutrition plan is suitable for you based on a short formula, consisting of your resting metabolic rate, daily activity level and daily calorie intake. The guide then provides you with a 7-day meal plan, consisting of five meals per day, for each of the three nutrition plans. I found this part of the plan extremely useful as I often struggle to come up with ideas for meals, and I’m certain other people have this problem too as it’s a common topic on fitness forums, so to look in this book and see 35 meal ideas (per nutrition plan = 105 meals!) meant I was spoilt for choice. This is your typical home workout calendar where you mark off each workout as you progress through the program. There’s additional space to make a record of your repetitions for each exercise you perform. It’s essential to use this workout calendar as it will help you stay motivated. 90 days may seem like a long time when you’re just starting the program, but it’s a great feeling when you look at your workout calendar and realize you’ve completed several weeks of training in what feels like a very short time. There are a lot of chin-ups included in the P90X workout program, so it is essential you have one of these. This is a meal replacement formula that contains proteins, carbohydrates and all the vitamins and minerals you need to help you recover from the P90X workouts. It is essential that you use a supplement like this throughout any program, so if you only purchase the P90X Base kit then you will need to purchase a recovery formula separately. Resistance bands are used in some of the P90X workouts so, again, if you only purchase the P90X Base kit you will need to purchase a set of these separately. Three resistance bands are included, each of which are of a varying width and color, which represents their resistance level and ultimately how challenging the exercise will be. These are, as you would expect, just another set of workouts. Initially I didn’t do them because I didn’t purchase the Ultimate kit but I subsequently purchased them separately. The workouts aren’t anything new but they are fast-paced, high intensity. My favorite is the Upper Plus workout, which consists of a form of strength training targeting the entire upper body. Again, I purchased the Power Stands separately as I hadn’t purchased the Ultimate kit. The Power Stands are designed to make performing push-ups more comfortable and reduce strain on the wrists, forearms and shoulders. As someone who suffers from wrist strain when performing push-ups, I can honestly say I really did find it much more comfortable to perform push-ups using the Power Stands rather than having hands flat on the floor in the traditional way. 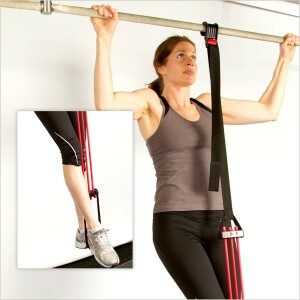 The Chin-Up Max is an adjustable band designed to be used with the P90X Chin-Up Bar. After adjusting the band to your required resistance level, you hook it onto the chin-up bar, slip your foot into the stirrup and perform your chin-ups as normal. It’s an essential tool if you’re not able to perform unassisted chin-ups, and a much better alternative to using a chair or asking some to hold your legs for assistance! Firstly, I knew that both chin-ups and the use of resistance bands are an essential part of P90X, therefore by not owning those pieces of equipment I would be severely limiting myself in terms of what exercises I could do during P90X. Secondly, I knew how essential a good recovery formula is, regardless of what type of training you’re doing, therefore I knew if I purchased the Base kit I would still need to purchase a recovery formula separately, which would probably cost more in the long run. I thought the Ultimate package was quite expensive, which is the primary reason I didn’t buy it, however I did immediately purchase the Chin-Up Max separately because I’ve always struggled with chin-ups. I later purchased the remainder of the equipment that is already included in the Ultimate kit. As stated above, I found the PowerStands a massive help and, whilst I wasn’t too interested in the additional bonus DVDs at first, they were the only thing I didn’t have and so decided to purchase them anyway. I probably should have just purchased the Ultimate kit in the first place as it ended up costing me more to buy everything separately! If you decide to purchase the barebones P90X kit, you can get the P90X Chin-up Bar and Chin-up Max Combo here and Tony Horton’s Power Stands here. Below is a brief comparison table allowing you to see easily what’s included with each kit, which should assist you further in deciding which is appropriate for you. Recommended if: You already have a good recovery formula and the essential equipment. You want all of the essentials included in one package. You can handle the bonus workouts and/or struggle with chin-ups. Click here to choose your P90X kit! In this part of the P90X workout review you will read about a typical P90X workout week, followed by a description of each of the workouts and finally there is a brief discussion on the three different routines included in P90X. Sunday you can take either as a rest day, or you can perform the X-Stretch workout. Ab Ripper X is workout which targets your abs and X Stretch is a workout which, as you can probably guess, is simply a slow-paced stretching workout. This can be performed on your rest day but is optional throughout P90X. Personally, I chose to perform X Stretch simply because I prefer to do some form of exercise on my rest day rather than doing nothing at all. Kenpo X is designed to be like a martial arts-based workout. There is a lot of punching, kicking and balancing exercises. As an ex-kickboxer, I really enjoyed this workout! Back when I was still wondering whether I should give the P90X workout program a try, I decided to check out some of the exercises in the workouts (as I always do, to ensure I’m going to enjoy the workout). I specifically looked at the legs and back workout and the chest and back workout, since these are the major muscles and are therefore typically the workouts I usually investigate. It starts with a balance lunge – 25 reps, then you’ll go on to the calf-raise squat, the reverse grip chin-up, the super skater (again 25 reps), the step back lunge and alternating sides lunge. If you find them too easy, you can always add some extra weight to make it more challenging. There are perhaps 20 or 30 different exercises just in this section, which should speak pretty clearly of the variation offered by the P90X workout program. They all target the same muscle group, but in different ways, which is important for the so-called muscle confusion and is sure to get your legs and back ripped. There are modifications offered to make things easier, for example, using the Chin-Up Max for the pull-up motions. The Chin-Up Max tool is great for getting you started with chin-ups. The push-up variations range from traditional push-ups, to wide-stance push-ups – designed to target the outer portion of your chest muscle – to push-ups with hands close together to target the inner portion of your chest muscle. The pull-ups and pull-downs are mostly, again, variations of themselves using different grip positions, such as wide-grip – designed to hit the outer back muscles such as the latissimus dorsi – and the narrow-grip – designed to target the inner upper-back muscles, such as the rhomboids. Additionally, the Chest and Back workout contains traditional back exercises, such as rows. In a gym, these are typically performed using either dumbbells or a barbell. 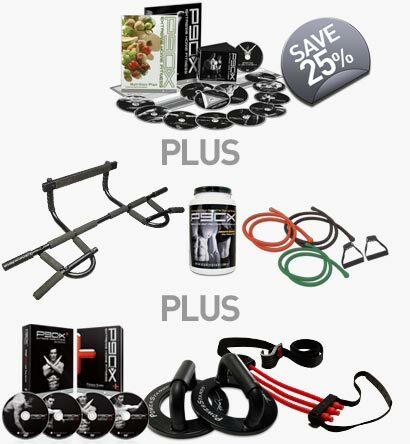 For P90X, you can use dumbbells or you can use the resistance bands included in the P90X Deluxe and Ultimate kits. Whilst we’re on the subject of dumbbells, I should quickly mention how good of an investment they are. As you know by this point, resistance bands are included in two of the P90X kits, however resistance bands only provide limited resistance – you can’t add more weight to them! There will come a point during the P90X workout program where your strength will increase to such a point that the resistance bands will provide no challenge, which will ultimately prevent your muscles from growing any further. This is where you need additional resistance which you can only get from the likes of a set of dumbbells. I was in such a position during my time with P90X but fortunately I had already purchased a set of dumbbells. If you consult the P90X workout program on BeachBody’s website you will discover that the resistance bands included weigh between 40 and 50 pounds. Obviously you should purchase a set of dumbbells heavier than this. Personally, I had already purchased this pair of adjustable dumbbells from Amazon, which allowed me to continue to build muscle and increase my strength long after I had outgrown the resistance bands. If you have more cash to invest then I highly recommend these PowerBlock Dumbbells. 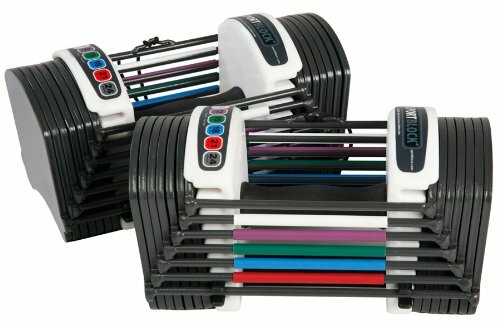 They are out of my price range, but a friend of mine owns the 70lb pair and not only do they look funky, they are easier to store as there’s no plates lying around and much easier to scale because, again, you don’t need to purchase additional plates as you do when you outgrow your current set of regular dumbbells. Yes, these are dumbbells. Funky-looking or what?! I get really bored really easily, so for me the variations of the workout were the greatest benefit of the program. Each workout is around 1 hour, but prepare to kill your abs on strength days, as the workouts are followed by the Ab Ripper X workout. The yoga days usually last a bit longer, with some workouts amounting to an hour and a half which, for me, is a bit long but fortunately there aren’t too many. This is the original routine that most people will do. It consists of a balanced routine of resistance, cardio, balance and overall conditioning workouts. Perfect for someone who is just starting or wants to both lose weight and build muscle. This routine offers quite a bit of a challenge. It includes the original workout plus three to four extra workouts per week. You will likely need to complete two workouts per day for three or four days per week on this routine, i.e. one in the morning then another at night. This routine is definitely suited to someone who is already quite fit and can give more time to the workouts. Lean focuses more on cardio than resistance training. This routine is better suited towards beginners, people more concerned with losing fat than building muscle or simply someone looking for a slightly easier workout routine. Personally, I did the classic routine, but I would love to try myself out with the doubles the next time I do the P90X workout program. What makes the lean different from the classic is that it doesn’t come with any Plyometrics – these are usually not recommended for people with weak or injured knees, so you might want to stick with the lean version if you suffer from knee issues. The P90X workouts, like most other at home workout programs, work in a circuit format, which means you’ll move from exercise to exercise with little rest in between – just enough to catch your breath, without slowing your heart rate. This high intensity way of training is an excellent way to lose weight and build muscle quickly. Also, because each day focuses on a different body part, you don’t risk overtraining one muscle group more than the other. The cardio-based workouts are what I found most interesting in the program – I hadn’t done much plyometrics, so that was fun, and I really enjoyed the KenpoX kickboxing, the cardio fitness and the stretching exercises. The Plyometrics is a pretty intense cardio workout, almost an hour straight that starts with a warm-up and then goes on to a series of jumping exercises. As I say, I have had some problems with jumping exercises and that’s why I prefer P90X to Insanity – the Plyometrics is tough and challenging, but doesn’t result in knee or lower back pain. When I was younger I suffered a serious lower-back injury during a football game and that injury has continued to plague me ever since. The first time I attempted Insanity I had to quit the program after performing the first two Cardio Abs workouts as it brought on back-pain. Also, as the P90X is an at home workout program you’ll have to make sure you have a soft landing surface for the jumps – and, preferably, neighbors who don’t mind the noise! Hopefully your neighbors won’t mind all the jumping around you’ll be doing! Well, it’s based on a unique system known as “muscle confusion”. This is achieved by significantly varying your workout schedule to focus on different muscle groups every workout, and introducing new moves so your body doesn’t get accustomed to them and stop progressing. This is very similar to the techniques professional athletes use to keep in their top form and is founded on a vast body of evidence. As the program lasts 90 days, you’ll change your workout schedule every 3-4 weeks or so, and you can decide if you want to focus on one aspect more than the others – I, personally, tried to get as much cardio training as strength training, but if you’re up for a challenge, you can try the ultra-intense Doubles route and get two workouts every day. In addition to targeting fat loss, P90X focuses significantly on muscle growth through strength training whereas, in my opinion, a lot of other home workout programs do not. With P90X you can both lose body fat and gain muscle at the same time! Click here to learn more. Generally, the P90X workout program isn’t suitable for people who have never exercised before. It’ll be extremely challenging for beginners, but I believe it can be done if you’re a beginner with the right attitude. It is more suitable for people who are already fit and want to improve their muscle tone or lose body fat. It’s a tough workout plan, but if you’re unsure whether you’ll be able to do it, you should complete the P90X fit test first. The P90X fit test will give you the minimum requirements for every exercise and if you find yourself not meeting the criteria then I’d advise you to start with some other workout plan and then slowly move on to P90X. P90 is the predecessor to P90X, and is perfect for beginners. Check out P90 here or read my P90 review here. Phase 1 is the Fat Shredder, which, as the name suggests, is a low in carbohydrate, high in protein diet, that will help you lose the extra pounds and prepare you for building muscle. Phase 2, The Energy Booster, on the other hand, is a more balanced combination with a higher amount of carbohydrates (and the same low amount of fats), which you’ll need if you plan to engage in lots of cardio. Phase 3 is the Endurance Maximizer, which offers higher levels of complex carbohydrates, moderate proteins, and very small amount of fat. The Results and Recovery Formula included with the Deluxe and Ultimate kits is specifically designed to boost your results and enhance your progress by adding quality nutrients to your now-efficient diet, so it’s highly recommended that you include the Recovery Formula in your diet plan. if you’re purchasing the Base kit the Recovery Formula won’t be included but you can get it separately for around $60 on Amazon. You can purchase either the tub or the packets. The tub usually offers better value for money but the individual packets are much more convenient. 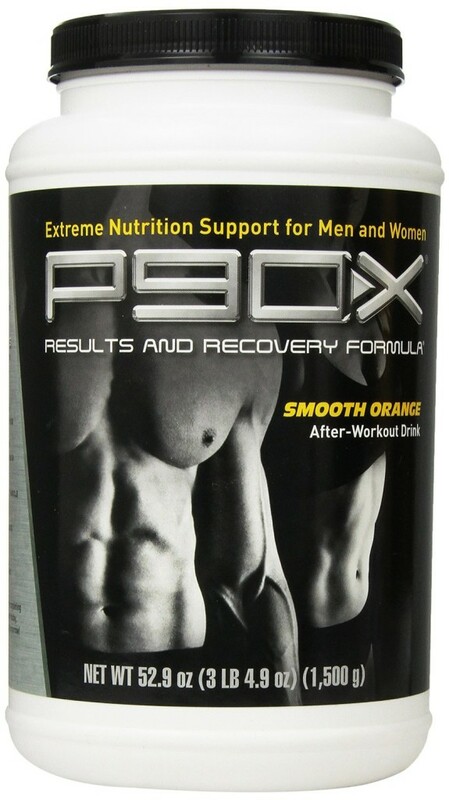 View the P90X Results and Recovery Formula tub. View the P90X Results and Recovery Formula packets. The three diet phases coincide with the exercise plan, but you can easily switch them around, until you’ve found the most suitable diet plan for you. Personally, I decided to go with what the experts from BeachBody have already planned out for me – they seem to know a great deal about how our bodies work and the dietary plan are designed to help you get the most out of your workout. The nutrition booklet outlines the daily eating plans, as well as offers a variety of recipes, which makes it easy to follow. The recipes are great; some are complex and others are simple and convenient, which is great if you don’t feel like wasting too much time cooking. 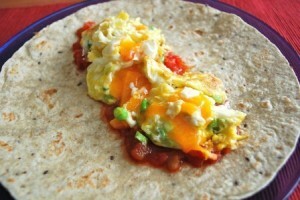 One of the delicious breakfast recipes included in the P90X nutrition guide. What Results Can You Expect From The P90X Workout Program? The P90X workout program promises amazing results in a short period of time, which makes most people – and, to be honest, myself included – doubt whether it’s the real thing or just a clever marketing trick. If you look around at P90X reviews on the Internet, you’ll notice a lot of unrealistic and unconvincing before and after shots designed to make you believe that you will look like Arnie after only 90 days. An example of what I believe to be an unrealistic transformation photo, taken from another P90X review site. For all I know, this transformation could be accurate, but I honestly don’t think it’s physiologically possible to go from having very little muscle mass to be being shredded in ninety days. Whilst the guy in the image above has obviously done very well, my guess is his the day one photo wasn’t taken ninety days before the day ninety photo; chances are it was taken years before, and they have been put together by resellers to try to convince potential buyers that extreme, never-before-seen transformations are possible with P90X in an attempt to drive up sales. In my opinion, these types of advertisements have the opposite effect because these days most consumers are much more savvy – and skeptical – when it comes to receiving marketing material. By the way, I’m not trying to diss the P90X product here – it’s a fantastic product! – I’m just stating that you should manage your expectations realistically and not get drawn in by the over-the-top marketing material. Do you currently look like Shrek but want to look like the Hulk? Then P90X is for you! Despite all of this, you’ll see thousands of people celebrating the program with their real before and after pictures, which is reassuring, and made me think actually, P90X does make sense, specifically because it’s based on a system that doesn’t allow your body to adapt and stop progressing. See, when we do an exercise for long enough, it gets easier and easier and at a certain point, we stop noticing any progress. This is when our body reaches the plateau and we know we need to switch to a more demanding workout plan. Instead of looking and creating one myself, P90X does the job for me, which is a great relief. The fitness guru, who’s behind the program has designed the workouts specifically to never allow your body to hit the plateau – it’s a constant challenge, from the first day to the 90th day. With P90X, you’ll have to kick out of your comfort zone, which is the only way you can force your body to change and prevent it from hitting that plateau. More reps, heavier weights, new moves, reduced rests, change the order of exercises – all of these are included in the P90X workout program. Here is a great example of how P90X has transformed a ‘skinny guy’. The resistance exercises in P90X have carved his body and added rock-hard muscle whilst the overall intensity of the workouts has kept him lean. 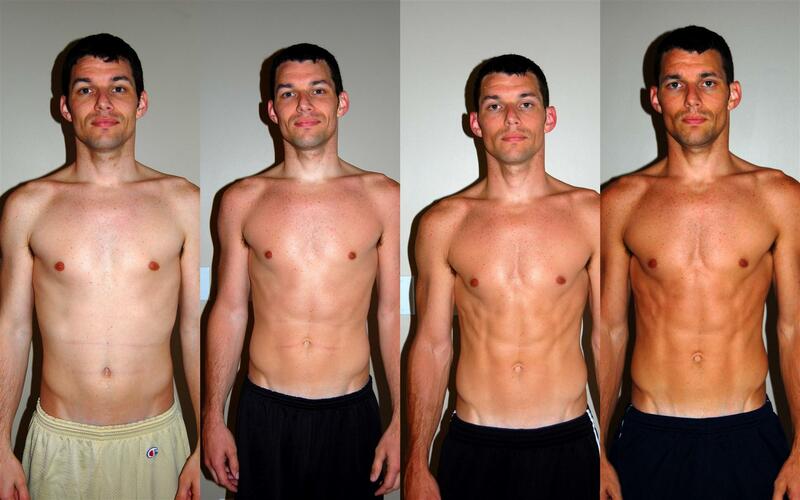 This guy went from ‘skinny’ to muscular in 90 days thanks to P90X. 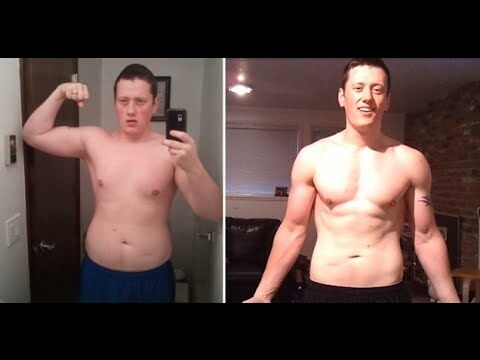 Here is another example of a great transformation but, by contrast, of an overweight guy who has lost a lot of fat and simultaneously gained muscle. This overweight guy’s before picture is actually very similar to how I used to look – those love handles bring back bad memories! This guy went from being overweight to lean with toned muscles thanks to P90X. Basically, whether you’re overweight or underweight, you’ll get great results with P90X. Whether you’re overweight or underweight, P90X can help you – click here! So, onto the results. As you can probably tell already, I’m quite impressed with my results from P90X. What is especially great about the program is that it provides you with accelerated results – it’s not a crash workout, but a carefully designed system that prepares your body and transforms it in a matter of just 90 days. It’s a good idea to take your measurements before you start the program. I, personally, took my body fat percentage, weight, chest, waist and thigh circumference, as well as my left and right arm measurements. My body fat percentage dropped by around 8% – and I can say I thought I was quite lean before I started the P90X workout program. My weight decreased a bit, which can be expected if you have a lot of fat stored. Some reviews comment on the fact that some people haven’t lost too much weight but, given that a major part of the P90X workout program focuses on building muscles through resistance exercises it’s normal for your actual weight to however that does not mean that you’re not losing fat – you will most certainly be simultaneously losing body fat and building muscle. We all known that muscle weighs more than fat so, depending on your goals and diet, there’s a chance your weight may not change at all, or you may even gain weight! Don’t panic if the scales don’t display what you expect, it doesn’t mean you’re not making progress – there’s more to measuring progress than just a number on a set of scales. 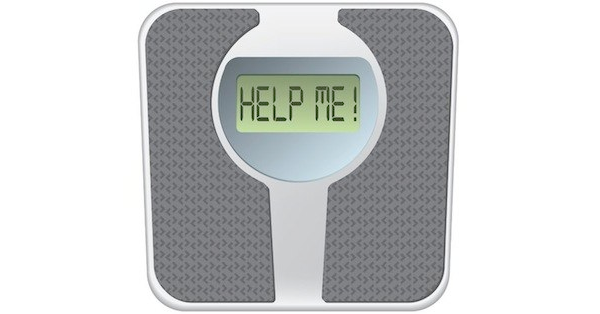 The scales aren’t the only tool to use to measure your progress. The P90X workout program is definitely challenging but, personally, I had a better experience with it than I did with some other at home workout programs. First, it offers a greater variety of exercises and is one of the few plans I know that include yoga and so much stretching. In fact, the creator of the program – Tony Horton – swears by his yoga exercises and even goes so far to say that, if he has to choose one type of exercise for the rest of his life, it would be yoga. …then P90X will literally make you scream and sweat tears. It’s a good kind of torture though, one that is specifically designed to force your body to change, so the screams will later turn to joy. There are a lot of push-ups and chin-ups, so people with lesser upper body strength would probably find these exercises incredibly challenging – don’t worry and don’t give up. You’ll build your upper body strength over time and you’ll find that the push-ups get easier and easier every time you do them. You can also try some exercise modifications – they aren’t included in the program, but, for instance, start doing push-ups on your knees and slowly build your way up to the instructor’s insane movements. After all, a modified exercise is better than no exercise at all! In this final part of the P90X workout review, I will discuss the overall benefits of the P90X workout program, it’s good points and bad points and its value for money. The pros of the P90X workout program is that it pushes you to your limit and is extreme, when it comes down to discipline, motivation and persistence. The three months of intense training and strength and cardio workouts will not only yield reward in the form of muscle and lost fat, it will also develop your attitude towards living healthily (if you don’t already have that kind of attitude), as well as build your will-power and discipline – all of which are essential for maintaining a healthy lifestyle. 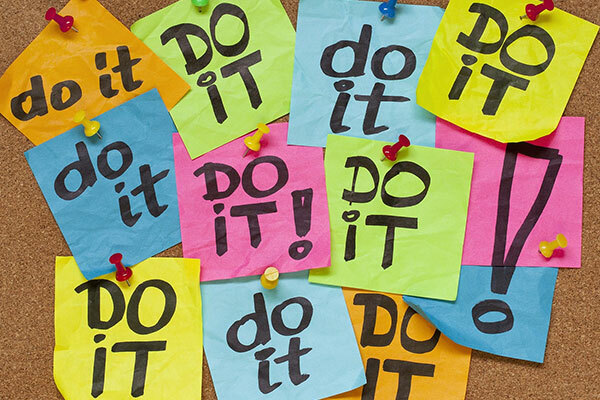 The six-day routine might look extreme to some – this is, after all, similar to the frequency of training professional athletes follow – but, for me, it was the perfect way to make sure I stay focused. You know that when you’re giving too much time to rest, not only does your muscle disappear, but so does your motivation. P90X is great in this way, because it gives you enough time to rest and catch your breath, while keeping you sharp, focused and excited at all times. P90X gives you all the motivation you need! Moreover, the P90X workout program provides you with all the information you need to make smart choices about healthy living and eating. I found the dietary guide extremely useful and I’m still recreating some of the recipes – especially the short, simple ones. The program is extensively researched and developed to suit almost all types of fitness levels and goals. Moreover, the length of the routine will probably make it hard for the average person to follow – it’s three months of intense, 6-day-a-week exercises, each of which lasts at least an hour. It might be hard to stick to it and commit to P90X completely, especially if you have a busy lifestyle or travel a lot, but I would definitely encourage you to try it out. There is a lot of heavy lifting involved, as well as jumping exercises, so it’s not exactly suitable for individuals who have knee or other injuries, or are not familiar with the bodybuilding techniques. I would also advise you to read a bit about the proper way to do lifting exercises – the technique is explained by the instructor very briefly and, in my opinion, maybe isnt detailed enough to prepare someone who has never lifted before. Finally, you should bear in mind that the dietary schedule is very strict. The first phase, the Fat Shredder – well, the name says enough – is designed to banish the fat from your body. This means a very, very strict diet with very few carbohydrates and very little fat. If you have lots of weight to lose or you’re one of the blessed with a fast metabolism, the carbohydrate requirements in the first phase might be a bit too harsh for you. If that’s the case, I’d maybe suggest to follow your own body and listen to what it’s telling you, instead of following the dietary plan blindly. Be flexible with your diet but try to adhere to the regimen, as much as possible. The same is true for the exercises – you’re not supposed to pause the video, but if you feel like you just can’t take anymore, stop and give yourself a rest. In the end, however, the P90X workout program is definitely worth purchasing. It offers great value for its money and BeachBody even offer a flexible plan that allows you to pay to try some of the exercises and then get a refund, if you find they’re not suitable for you. With its unique system, based on muscle confusion, P90X will most certainly help you build up your strength and muscle mass, get rid of the fat and transform your body – as well as mind. I’m aware that some people are more comfortable purchasing products from Amazon – they’re the biggest, most-trusted online retailer in the world for a reason! – so if you’re happy to spend the extra $20 then by all means get yours from there, though I can assure you BeachBody’s service is of the highest standard – they’re easily contactable, friendly and always get back to you quickly and efficiently. Have you completed P90X yet, or has this review inspired you to take the challenge? Let me know your thoughts in the comments below! great to read genuine reviews at last from someone who’s actually done the program Thank you!